Also, such confusion is more common for skills that involve cognitive ability but less so for physical ability. Fewer people deny that genes play a role in Usain Bolt’s speed, but for things such as math, writing, music, or chess, genes are perceived as less important, probably because there is not an obvious physical difference between chess players, than, say, 6′4″ Usain Bolt and a typical 5′10″ person. One cannot ‘see’ highly g-loaded traits in the same way one sees that an elite weightlifter or NFL linebacker is physically bigger than an average person, and hence is stronger. Opportunity is a thing. Experience is a thing. Practice is a thing (and the right kind of practice appears to be the biggest thing of all). In certain endeavors, your body’s size and shape are things that matter – Michael Phelps’ clown-shoe sized feet certainly don’t hurt when it comes to swimming, and no matter how much or how well my daughter practices, she will never be an elite NFL Line(wo)man at 5’2 and about 100 pounds. But the concept that some people, in our case writers, have an innate ability that makes them superior to us (or that we have an innate ability that gives us some kind of leg up) is just flatly and empirically wrong. Yes, but genes that predict manifest cognitive ability, such as writing and math ability, are as ‘real’ as, say, genes that manifest in physical attributes such height and body somatotype. But genes matter. Talent matters…for almost everything. The same reasoning explains why elite swimmers are big. Great male swimmers often are 6 feet 4 inches tall, and muscular. And because of the advantage that large muscles give for sprints over short distances, the shorter the distance an athlete must swim, the greater the advantage it is to be big. Tall swimmers also have another advantage: because swimmers are horizontal in the water, their long bodies give them an automatic edge. “It’s the difference between long canoes and short canoes,” Dr. Joyner said. Bobby Fisher is considered one of the greatest chessmaters of all time and is the youngest U.S champion at just 15 years old. Same for Magnus Carlsen, a Norwegian former chess prodigy who is now the number-one ranked chessmaster in the world. Both have very high IQs. Although IQ is in no way perfectly predictive of chess ability, having a high IQ helps a lot. Lance Armstrong, due to a abnormally high VO2 max level and lactic acid threshold, was literally as good as an elite cyclist within a year of training, and he won his first competition at the age of 13. In in terms at success at bodybuilding and elite weightlifting, some people respond much better to resistance training than others in terms of strength and muscle volume gains. Physical attributes such as bone size and muscle insertions play an important role in strength and aesthetic appeal. Although performance enhancing drugs are used to overcome one’s limitations, ironically, when everyone is using these drugs, in many instances they only heighten individual biological differences. Some people respond better to steroids than others and experience fewer side effects from taking these drugs, and drugs cannot change one’s underlying physical structure. Professional arm wrestlers, for example, tend to have really thick wrists and large hands and forearms relative to the general population and predicted by height alone. Math and writing ability are highly g-loaded, and are heritable and polygenic. Smart, mathematically-inclined parents tend to have smart, mathematically-inclined kids. Because g-loaded abilities are all highly correlated, skill at math is correlated with skill at writing, as well as a multitude of other abilities such as spatial manipulation, ability to make inferences (which is why LSAT scores are correlated with IQ and why Mensa uses the LSAT for admissions purposes), reading speed, and short-term and long-term memory. David Foster Wallace, whose dad was a professor, at the age of 6, when most kids are only learning how to read, was already composing poems. Top Scrabble players have very high verbal IQ, which is biological. Jeopardy champions practice a lot, yes, but they have a superior ability to memorize facts, which is again biological and correlated with IQ. Even as early as kindergarten and first grade, long before 10,000 hours of practice can kick in, teachers can readily identify kids who have the potential for success, versus those who don’t (or at least are better-suited for trades/vocational work or low-skilled service sector work, than knowledge-economy based work). Educators can no longer tell parents that their kid is slow or learning disabled, but instead use intentionally-vague euphemisms such as ‘differently-abled’. The exaltation of practice lends justification to America’s defective education system that keeps throwing good at the bad trying to get slow kids up to speed. China is moving in the right direction, whereas in America most kids, talented and dull alike, are put through the same factory-style education system. The result is that resources are wasted on misguided but well-intentioned policy in the hope that with enough costly intervention, slow kids can be brought up to speed and be be as successful as adults as smarter kids. Although America is already economically competitive, it would be even more so if it were not held back by such delusions. Again, to reiterate, this is not to say practice is worthless or should be discouraged, but is it still no substitute for talent. Someone without talent who practices a lot can improve and get ‘pretty good,’ but will never be able to compete in the same league as those who are talented and practice. At the age of eight, after just two years of studying chess, he was already holding his own against masters. The family resided in a “small, basic, but habitable” apartment. It was there that “Fischer soon became so engrossed in the game that Regina feared he was spending too much time alone”. As a result, on November 14, 1950, Regina sent a postcard to the Brooklyn Eagle newspaper, seeking to place an ad inquiring whether other children of Bobby’s age might be interested in playing chess with him. The paper rejected her ad, because no one could figure out how to classify it, but forwarded her inquiry to Hermann Helms, the “Dean of American Chess”, who told her that Master Max Pavey, former Scottish champion, would be giving a simultaneous exhibition on January 17, 1951. Fischer played in the exhibition. Although he held on for 15 minutes, drawing a crowd of onlookers, he eventually lost to the chess master. Parents who excel at math produce children who excel at math. This is according to a recent study that shows a distinct transfer of math skills from parent to child. The study specifically explored intergenerational transmission — the concept of parental influence on an offspring’s behavior or psychology — in mathematic capabilities. Within the study, Pitt’s researchers found that the performance levels for early school-aged children on standardized mathematic tests could be reliably predicted by their parent’s performance on similar examinations. Specifically, they observed major correlations in parent-child performance in such key areas as mathematical computations, number-fact recall, and word problem analysis. Surprisingly, the researchers also found that children’s intuitive sense of numbers — i.e. the ability to know that 20 jelly beans are more than 10 jelly beans without first counting them — is predicted by their parents’ intuitive sense of numbers. Researchers determined that such close result parallels could not have been produced through similar institutional learning backgrounds because their previous research showed that this intuitive sense of numbers is present in infancy. 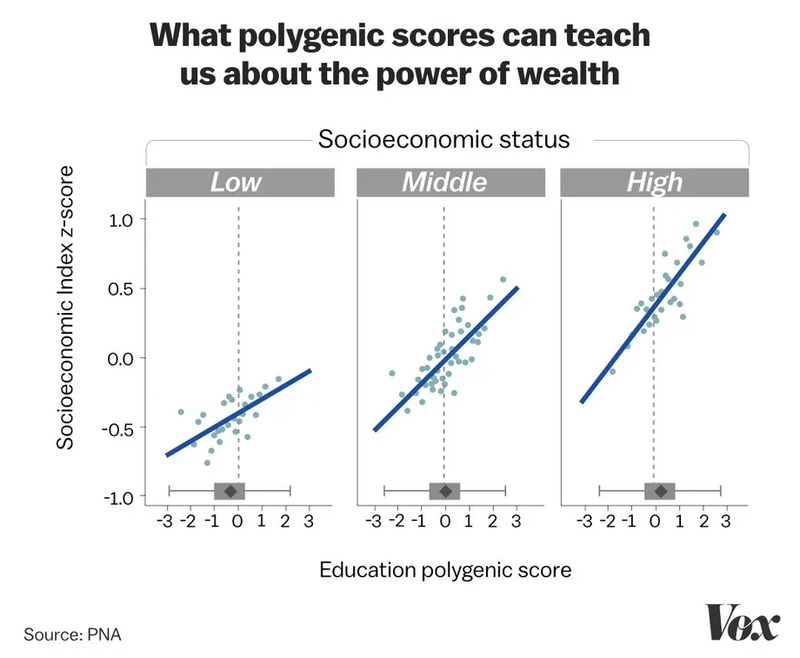 Harden pointed me toward a graph from a recent study in PNAS on whether polygenic risk scores for education can predict upward social mobility (that is, can genetics explain why some people who start off poorer in life end up richer later on?). The x-axis of the chart is polygenic scores for educational attainment. The y-axis is a measure of socioeconomic success as an adult. And the chart is broken down into what types of homes the participants were born into (lower class, middle class, or upper class). GWAs studies show that at least 25% of the variation of IQ can be explained by SNPs.